Money In The Bank. “It’s more important than ever that customers understand the risk associated with where they place their funds,” says Ashley Roberts, private banking officer with Republic Bank in Kentucky. The best way to be certain about your funds is “with the backing of the United States government in the form of FDIC insurance,” Roberts explains. Though most are familiar with FDIC, coverage can be somewhat confusing depending on how your bank accounts are titled. Currently, the basic coverage limits are $250,000 per owner, per participating bank. To see if your accounts are fully covered, go online to www.fdic.gov and use EDIE, an online coverage estimator. You can also call toll-free (877) ASK-FDIC. Money Under The Mattress. Under the mattress, in the cookie jar, buried outside, or in the freezer might feel like a comfortable place to keep your money, but there are too many “what could go wrong” variables, making this the least safe option of all. For one, the money you keep at your home is not insured. It could also be lost, stolen, or easily accessible for spending. 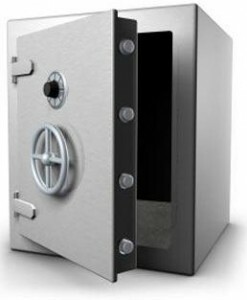 While it’s appropriate to keep some cash on hand, large sums of money are most suitable in a bank environment with tight security and monitoring. Money In Investment Accounts. While there is nothing equivalent to FDIC insurance for investment accounts, many brokerage firms are members of SIPC, or the Securities Investor Protection Corporation, www.sipc.org. “SIPC does not cover individuals who are sold worthless stocks and other securities. SIPC helps individuals whose money, stocks, and other securities are stolen by a broker or put at risk when a brokerage firm fails for other reasons.” In other words, it does not guarantee your account will not lose value, but rather that it will step in should your broker or brokerage firm fail. Where do you turn when you think that your money is in jeopardy? The headlines grip us every day with worries that our money is not safe. But, is it safe? What are the best options?